Auburn and Mississippi State are teams that still harbor hopes of challenging Alabama for the Southeastern Conference Western Division title. That probably won’t happen unless the Tigers and Bulldogs can fix their offense. Both the eighth-ranked Tigers and Bulldogs have struggled to move the ball and score points this season, especially against good competition. Auburn (4-1, 1-1 SEC) ranks 12th out of 14 teams in the league in total offense with about 376 yards per game. The Tigers travel to face Mississippi State (3-2, 0-2) on Saturday. Auburn’s veteran quarterback Jarrett Stidham has been solid, even if he hasn’t put up huge numbers. The pedestrian running game is a bigger surprise — the Tigers are averaging 178.6 yards on the ground. Mississippi State quarterback Nick Fitzgerald is completing just 49 percent of his passes this season. He’s also struggled to run the ball. One bright spot is the production of running backs Kylin Hill and Aeris Williams, who are both averaging at least seven yards per carry. Mississippi State’s first-year coach Joe Moorhead said the pair has to have a big role in the offense going forward. “We are examining more and more ways to make sure that when we call a run it gets put in the running back’s stomach and that he runs it as opposed to either a pull and a quarterback run or a pull and throw,” Moorhead said. Fitzgerald needs 144 yards rushing against Auburn to break Tim Tebow’s Southeastern Conference record for most career yards rushing by a quarterback. The 6-foot-5, 230-pound senior has struggled when running the ball during his first two SEC games this season, with a combined 52 yards rushing in losses to Kentucky and Florida. Mississippi State is still searching for a true No. 1 option in the passing game this season. The Bulldogs have six players who have caught at least six passes but no one has more than 12 receptions. Sophomore Osirus Mitchell leads the team with 12 catches for 219 yards and two touchdowns, but he had a crucial drop in the loss to Florida last week. Auburn’s leading rusher JaTarvious Whitlow’s status is uncertain after he sustained a shoulder injury against Southern Miss. It’s a potentially big blow for a running game that’s already struggling, ranking 10th in the league. Tackles Prince Tega Wanogho and Jack Driscoll also sustained unspecified leg injuries in the game. 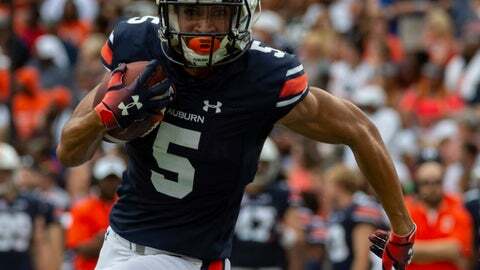 All three did participate on a limited basis in practice by Tuesday, Malzahn said. Kam Martin would take over as the lead runner if Whitlow can’t play. This is Auburn’s first trip to a hostile stadium after opening with Washington in Atlanta. Malzahn is concerned about how his team deals with the clanging of all those cowbells. The game features two of the SEC’s better defensive lines and both are among the league’s top four teams in sacks per game. The Bulldogs are led by Montez Sweat and Jeffery Simmons while Auburn counters with Dontavious Russell, Derrick Brown and Marlon Anderson.